A new trend that could infect you with America’s favorite bacteria, salmonella. Locking lips with chickens? … Or beaks. Whatever. It’s the new epidemic on the block. The US fell into boredom with the three people ebola outbreak and the news has gone silent on covering epidemics. Until now. Cuddling with Chickens! Don’t stay unaware when handling your pet chickens. Almost 200 hundred people in the US has spent some of their past time getting cuddly with chickens, and getting infected with salmonella. No death from the outbreak has been reported, but 33 of the infected were serious enough to be hospitalized. While interviewed, 86% mentioned that they got a little friendly with their poultry. Kissing, or cuddling. The CDC (Center for Disease Control) estimated that the bacteria is responsible for close to 1.2 million illnesses and 450 deaths last year in the US. It is not a disease to be taken lightly. Children or the elderly are most likely to get the disease, so if you have children, and you have chickens, make sure they keep a safe distance from those salmonella factory machines. The best way to prevent the bacterial infection from running free into your system, is by washing your hands and fingers with soap and water. But If those resources are not available, use an alcohol-based hand sanitizer with at least 60% alcohol. These chickens are dangerous, so keep your hands clean after coming into contact with one. So please learn how to handle your pet chicken, and keep children and the elderly away from them. They are the most likely to get infected because of their poorer immune systems. And if they do, make sure they don’t cuddle with the chicken, especially kiss it. No one likes having abdominal pains, or running to the bathroom with diarrhea. So stay within your species and keep your lips away from these little peckers. It’s been a while since I had some Rhode Island Reds of my own, but this made me chuckle. 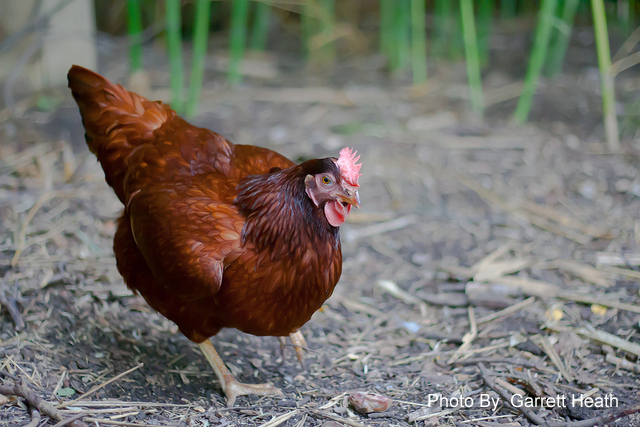 While my better half and myself were visiting in Buffalo a few days ago I saw actual evidence that convinced me that the Rhode Island Red hen is a good layer and has more common sense than a hen is usually credited with. We had done the usual round of libraries, theaters, the zoo, etc., and were mighty well pleased when our hostess informed us Sunday morning that we would drive out of the city about ten miles for a picnic dinner. These people are building a country home out there with sunken gardens, trout pools and all the trimmings. Their house is under construction, and a tent answers for a house when they run out on Sundays. We had a fine dinner – corn roasted on an open fire, potatoes baked on the same fire and a long list of good things no dinner is complete without. During the meal I noticed several hens of various breeds working nearer our table which was outdoors in front of the tent. There were one or two Barred Rocks, several Rhode Island Reds and some White Leghorns. They fared very well from the crumbs, corn cobs, etc., and seemed to be enjoying the meal at much as we were. At the conclusion of our dinner after everything had been straightened up and we were preparing to leave I went into the tent for some reason. I don’t recall now, and… well I wish I could have taken a picture of what I saw. There was a sort of cupboard at the back end of the tent where they keep cooking utensils and on the third shelf from the floor perfectly calm and undisturbed, sat a Rhode Island Red hen in a frying pan. I immediately called the rest of the party and just as they all came in the tent “Biddy” cackled a couple times, hopped down and walked out of the tent, leaving a nice brown egg in the frying pan. If that isn’t evidence of common sense and good laying, then I don’t know what is! 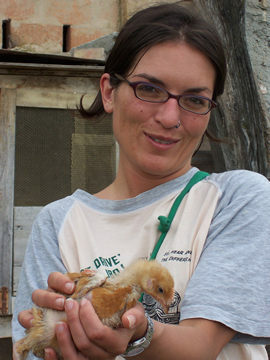 Welcome to my site on backyard chicken keeping. 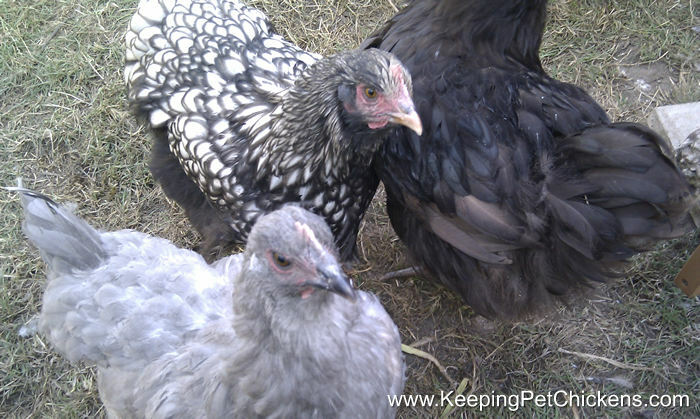 As with many chicken keepers my girls are more for pets than for eggs – which is just as well, as if I work out the setup costs like purchasing them, the feeders, waterers and the coop itself, eggs are costing about $20 each! They have only just started laying though, so I am hoping things will improve, but I think it will be years, if ever, before I can say homegrown is cheaper than store bought.